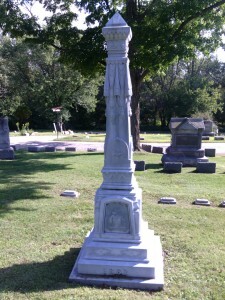 When the old Elgin Cemetery on Channing Street began to reach capacity, the City of Elgin bought land at its southeast comer, formerly owned by the Gifford and Whitecomb families, for a municipal cemetery. Bluff City Cemetery opened in 1889, and caskets from the Channing Street cemetery were gradually moved to the new site. Those who died before 1889 had a temporary resting place elsewhere—Grave markers with a date of death prior to 1889 were moved, along with the bodies, from Channing Cemetery and reburied at Bluff City Cemetery. 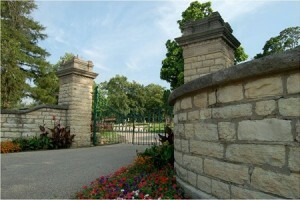 Bluff City Cemetery consists of 107.8 acres of land. The “White Bronze” monuments at Bluff City Cemetery are actually made of zinc, a non-magnetic metal which resists corrosion. 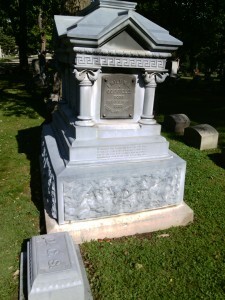 All these monuments were originally set in place at the Channing Street cemetery, but were moved with the remains over the years. In 1873 a new material was created for use as grave markers by two men, M.A. Richardson and C.J. Willard. An alloy of zinc, copper and tin was produced that showed a great deal of promise in producing a marker that would stand the test of time. The method of casting these monuments was much the same as casting any other metallic object. First an artist would design a pattern in wax, which would be covered with plaster. When the plaster had thoroughly set, the wax was heated and ran off and a form for casting would be ready to use. Panels would then be soldered together using pure zinc producing the monuments. The larger monuments had a place to put a panel that could be screwed on with the names of the deceased. The screws were of a design that would resist tampering, however nothing is foolproof and some people found ways to remove the front panel. The monuments were hollow and some devious individuals were able to access the interior, some like the gardeners who stored their tools and others who secreted contraband within the monuments. Thieves were known to open the monuments and hide their loot and during prohibition criminals would hide liquor behind the panels for their customers to retrieve later.